My kids will be on a break from school soon, and that means it will be my job to keep them occupied all day. Usually the first few days are fun and exciting, and then I start to hear: "Mom! I&apos;m bored!" After that comes the fighting and arguing! It becomes clear that we need to get out of the house and find something fun to do. When we&apos;re in the middle of a cold Indiana winter, keeping kids busy isn&apos;t as easy as heading to a playground. 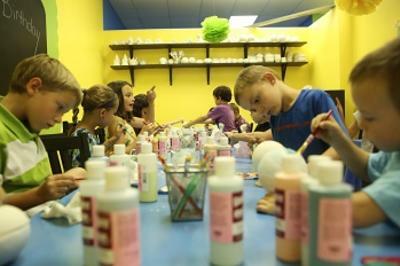 But Hendricks County offers lots of indoor fun that is enjoyable all year long. Here are some of my family&apos;s favorite ways to fill cold winter days in Hendricks County, hopefully you will find some fun here, too! It&apos;s amazing what happens when my kids can&apos;t go outside to burn off their energy. They unleash all of their enthusiasm on each other and our house! That&apos;s why I am thankful for places like Sky Zone. Kids can bounce and jump until they&apos;re completely worn out. Grown-ups can join in the fun or sit back and relax! My kids love to do art projects, but sometimes paint and markers get a little out of control. uPaint Pottery Studio allows you to get creative in a spacious studio, and you get to take home your own painted pottery creation. You don&apos;t have to be a great artist; you just have to be ready to have fun. No appointment is needed, just come by ready to create your masterpiece! It&apos;s no secret that our family loves Who North America, and it&apos;s a great spot to visit on a cold winter day. Head to the back room to enjoy some free pinball and video games, browse the vast collection of classic Doctor Who merchandise and purchase some cool Doctor Who gear to take home! The Hendricks County Historical Museum is another one of our favorite places to visit. Christmas is the perfect time to check it out, because it&apos;s beautifully decorated for the holidays. The original jail cell downstairs is always the highlight of the trip for my kids, and yours will love it, too! Confession: I can&apos;t roller skate. But I can appreciate a place where my kids can skate around until their hearts are content! Hot Skates also has concessions, a parent lounge and arcade games, so everyone can find something to do. Be sure to check their schedule for skate times and holiday hours. Monster Mini Golf has all the ingredients for a fun winter outing. It&apos;s indoors, it&apos;s glow-in-the-dark and it features games, a DJ, snacks and special prizes. Oh, and it has 18 holes of mini-golf fun! We&apos;ve found Monster Mini Golf is especially good for school-aged kids. The holiday season is the perfect time to see a movie with your family, and I think the Royal Theater is the perfect place. It&apos;s an affordable option, with a vintage atmosphere that makes attending the movies a true event. See a new release, or check out their Retro Rewinds and replaying of holiday classics. Another confession: I hate to bowl. My kids, however, love bowling, and I love anything that holds their attention! Sunshine Bowling Center is a great place for a family bowling night. It&apos;s been remodeled in the last couple of years, and it&apos;s a clean and bright facility with a friendly staff and really tasty food. The adjacent All-Sports Pub makes it great for an adult outing or date night as well. I remember vividly my first trip to the Pizza King in Avon when I was a kid. TVs in the booths? A train that brings your drinks? Video games? Does it get any cooler than that? Well, if my kids are any indication, Pizza King is still a pretty cool place to visit. 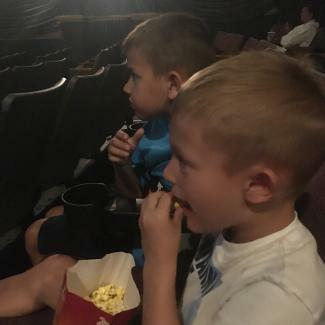 They love the train and the TV, and we all love the pizza and bread sticks. Make a special trip there for lunch or dinner, or stop by after visiting another one of the spots on this list! I have yet to meet someone who doesn&apos;t enjoy a good Christmas light display. The Winterland Light Show will be up at Ellis Park through Dec. 30, so you have plenty of time to enjoy it -- all from the warmth of your car! Check out our recent blog post about local light displays! Hopefully these ideas for fun and frustration-free holiday time will help your winter break to be the best one yet! For more great ideas, be sure to check out our Events Calendar and Things to Do listings.